One of the officers “immediately began to laugh” until he realized they might be actually be stuck out on the lake, he told BuzzFeed News. 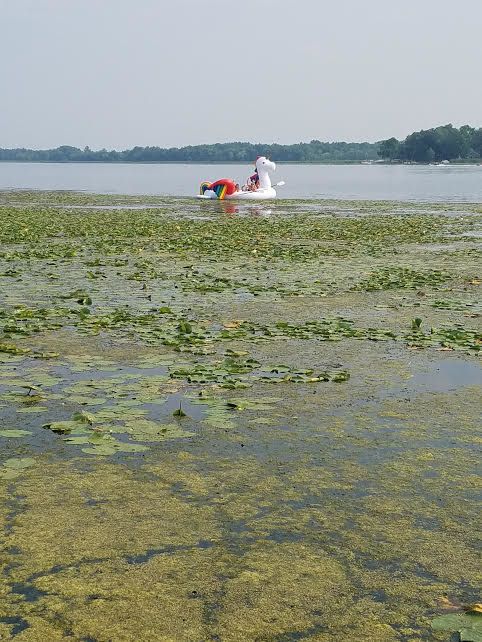 A group of women in Minnesota had to be pulled to safety by sheriff's deputies Saturday after they got stuck on a lake on a rainbow unicorn float for hours. Deputy Scotty Finnegan and his partner, Deputy Dawn De Steno, of the Chisago County Sheriff’s Office were patrolling along Fish Lake when he “observed the large inflatable and immediately began to laugh,” Finnegan told BuzzFeed News. They noticed that the women had paddles, but were struggling to paddle their way through weeds in the lake, so they pulled over to assist. Finnegan said the women were floating on the unicorn “for a couple of hours” that day. The officers determined the best way to rescue them would be to toss them a line and pull them in. The sheriff’s office recorded and shared the moment online. Some outlets have wrongfully reported that there were five women rescued. 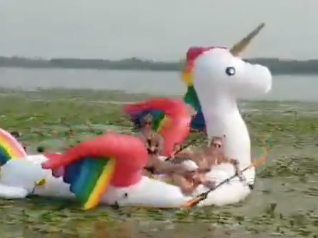 Finnegan clarified to BuzzFeed News that there were only four women on the unicorn float itself. “The fifth woman from the group was heavily entertained from the dock fishing and poking fun at her friends,” he said.